Artisan Crafted West African Wood Wall Mask from Ghana, "Jama II"
Luminous and bright, this West African mask presented by Saeed Musah of Ghana is a stunning addition to your home decor. 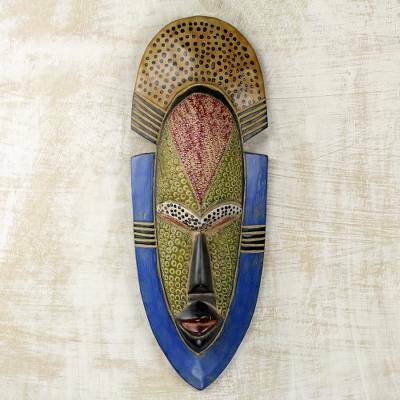 This unique wall mask is hand carved from wood and accented by an aluminum dotted motif. Jama means "Happiness" in the Ga language. You can find african wood mask 'Jama II' by Saeed Musah in masks categories such as Ghanaian Masks, Wood Masks and Metal Masks. Enjoy exploring these sections for other Novica treasures. "Beautiful addition to my Africa wall"